This may be one of the most random posts I’ve ever written. It’s just an ensemble of news/updates/internal realizations. First, it’s quite surreal these days here in my country. Those days when you suddenly turn on CNN and the reporter is talking about the Pope visiting Ecuador, Bolivia and Paraguay. You see, we’re never on the news, unless something terrible happened, and this time, we’re on them because of something good, for a chance. Although, I’m a bit worried by the Pope’s arrival in El Alto (4000 meters above sea level… oh I may need to convert this for some readers 🙂 13123.36 feet above sea level (according to Google)) He’s scheduled to arrive this Wednesday and then go down to La Paz 12,087 altitude and then in less than 4 hours go back to El Alto. Did they think this well? I mean, altitude sickness is real! I often go to La Paz and it’s not always that easy, specially if you’re not used to it. For what I’m really crossing my fingers, is that it won’t be the same as in Ecuador (Quito) where the Pope’s security were running along the Pope’s vehicle today. I mean, if they were to try that in El Alto, they will faint in a matter of seconds. Most people usually need a whole night in El Alto and in La Paz in order to get used to altitude. Anyway… I hope we’re not on the news because the Vatican staff and the Pope’s delegation got sick when they arrived to Bolivia. And on other news/realizations, I just realized I must have been an eskimo in my previous life. You see, in the southern hemisphere, we’re in the middle of the winter right now. But our winters are not that severe as the ones in Europe, for example. But I love cold weather. I absolutely adore it. And I’m kind of a vampire for sunny/warm days. Also my dream Holidays are not in a caribbean beach resort but in a lovely wooden cottage in Iceland or Finland 🙂 Yeah, I know I’m crazy, but I just love snowy mountains, cold breeze on your cheeks, and wearing my mittens 🙂 This past Saturday, we had a sudden drop of temperatures in the whole country. It rained and it snowed in the mountains and in some cities. Unfortunately, in my city it doesn’t get to snow, but the mountains around the city get white snowy and beautiful. I was thrilled and excited but my friends, work colleagues, family, etc., they were all suffering; the poor ones. It got colder than usual, Europe cold, (or at least it made me remember my days of living in Scotland) Everybody was feeling miserable and I was all smiley. I know, I must be crazy. And if there’s such thing as as previous life, then definitely I was an eskimo or a wild person from the mountains in Alaska. 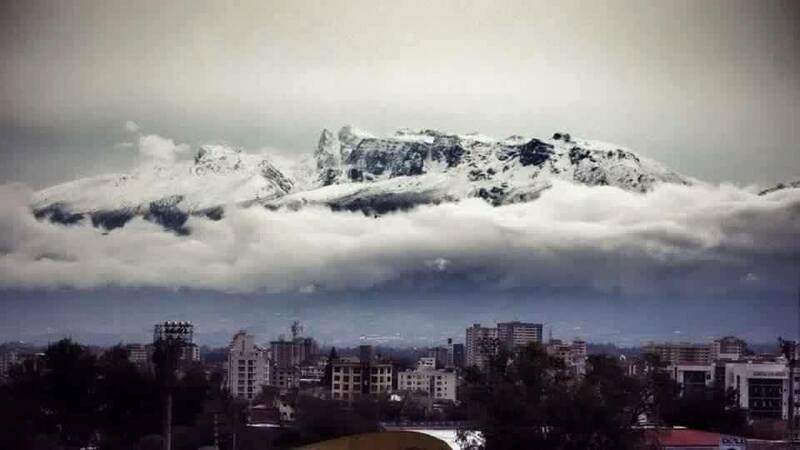 Anyway, I thought this was a good chance to show a picture of my city, Cochabamba, these days. Next Editing services, why you need to love them! and the theory of the Leprechaun that lives in our heads. Don’t worry about the Pope. I’m originally from along the Rocky Mountains, Denver in fact. It’s one mile(5000+ feet) above sea level. The highest point in the Rocky Mountains is Mount Evans, which is just a little higher up than La Paz. The tourist industry is enormous there because of this one mountain AND all the ski resorts. People go up and down those mountains all the time from places like New York, sometimes by vehicle, sometimes by plane. He’ll be just fine. It sounds to me that an PR rep. needs to be fired. Just because he’s the Pope don’t mean he’s superhuman. The poor man. I hope he’s persuaded to take a long rest. From what I have read and heard, he was a good choice for the position of being the representative of The Church. I want him to stay around a while. What a beautiful photo. And i dread to think of those altitude changes. The pope is hardly fit for that kind of strenuous activity. I love the snow but those places far north have little sunlight, which makes for l-o-n-g winters! Could you handle that? I’m kind of vampire for the sun 🙂 I’m that person that you’ll find hiding from the sun with an umbrella, a hat, and tons of sunblock. Around 90% of the year here in my city is sunny, but too sunny, not even a cloud, too bright, so whenever we get a cloudy day I’m jumping around. Many years ago I got the opportunity to live for one year in Glasgow, Scotland. I noticed how students, like me, were kind of depressed during the winter months. I actually enjoyed it and didn’t miss the sunny days at all. I know I’m kind of crazy in that aspect 😀 … Maybe some people are cut for those long winters 🙂 Anyway thanks for stopping by! It sounds like you are a perfect candidate for Scotland or Scandinavia! Great shot of Cocha! I am amazed how much it has snowed in the mountains!